Arthritis of any or all 3 joints below the ankle can cause significant discomfort, pain and disability. Arthritis can result from trauma (such as calcaneal fractures), inflammatory conditions (such as Rheumatoid arthritis) or related conditions such as tibialis posterior tendinosis. While non-operative treatment which customs orthotics (insole) and bracing can help in some cases, surgery is often indicated. Arthrodesis (fusion) of the affected joint or joints can be very effective in relieving severe pain. Dr Beischer has been involved in researching gait (walking pattern) after such surgery. X-Ray of patient postoperatively who has undergone a triple fusion. 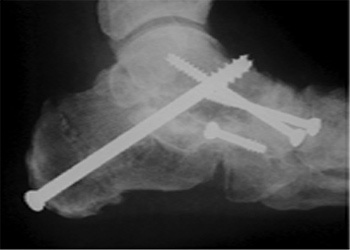 That is a fusion of 3 joints below the ankle, the Subtalar, calcaneocuboid and talonavicular joints.